ca 500 - 475 B.C. The sun-god Helius rises from the river Oceanus at dawn . He is crowned with the shining aureole of the sun and drives a four-horse (quadriga) chariot. 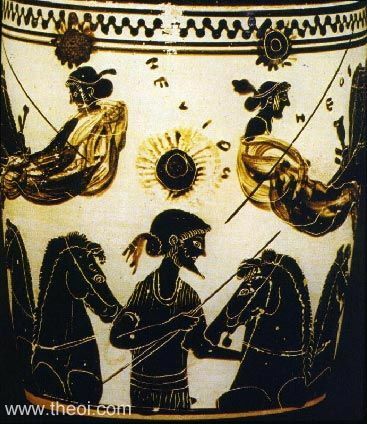 Above him, on the left, is Nyx (labelled Nyks), goddess of the night, crowned with dark mists and driving a four-horse chariot. Facing her is the nearly identical figure of Eos (labelled Heos), goddess of the day, crowned with a swirl representing light and driving a four-horse chariot. Heracles (not shown) sits on a hill to the right roasting meat on spits over a fire. The painting perhaps illustrates the tale of the hero's ambush of the sun-god.